Does Drawing Hair Get in Your Hair? When you draw people, you can't get away without drawing hair unless they're totally bald :). 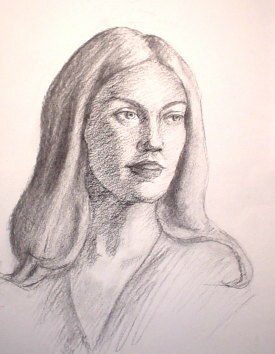 The hair style and the way it frames your subject's head has a tremendous impact on their appearance. We have all experienced this. For example, have you ever had a friend change their hair style and you didn't even recognize them at first? Since hair affects a person's look so much, your challenge as an artist is to know how to draw all kinds of hair, be it curly, flat, or whatever. On this page, I am going to show you how I draw realistic hair. The fundamentals of drawing hair, once you have learned them, also apply to other genres of drawing, such as manga, cartoons, etc. Hair follows the spherical form of the head underneath and your drawing should reflect that.. The shape of the skull underlies the look of the hair. Treat hair as “units” of shapes that lie next to each other. Break the total hair mass into frontal, middle and back sections. Keep in mind that light conditions have a big impact on how these masses appear. 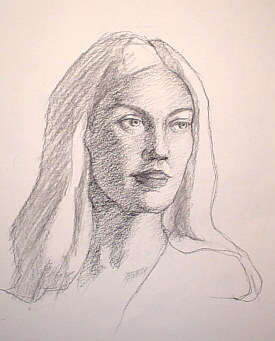 Create depth and model the form of the hair first once the masses are lay in. Details like the curly bangs are the last thing you worry about. I'm using my daughter's HB2 pencil to draw and shade the face first. I put all the shadows and middle tones in place because by doing so I have an idea of where the light is coming from. Keeping this in mind, I will have better control over shading and modeling the hair later. I now draw the outline of the hair. I make sure I know where the top and the back of her skull is. I also add big lines in the hair indicating the planes of the hair masses. If you have a subject to copy from, measuring will ensure you get the boundaries of the hair right. If you are drawing hair from memory or imagination, then be aware of the basic anatomy of a human head. I look for the general shadow and light patterns. I divide the tonal relationship in two shades: dark and light. I do the shading by tilting the pencil, instead of using the tip of the pencil. This way I can cover the areas rapidly and save time. Now it is time to differentiate among the tones within the shadow. 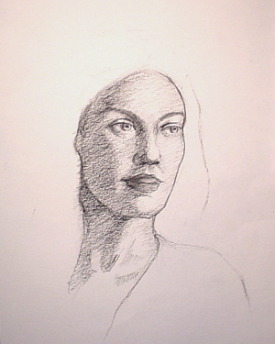 By squinting at the picture of the subject, I soon see more shades within that mass and shade accordingly. I constantly compare one shade with one another for a unified value(tonal) relationship. Without it, the hair will not look real. Her blond hair in shadow will look dark, but not as starkly dark as that of a person with darker hair. 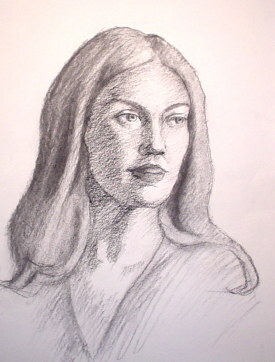 So I darken the crevices around her face and behind her ears to make the hair recede properly. I now look for those details I call bands, curls, or waves. I refine their individual shapes only after I finish the overall shadow pattern on which these tiny shapes are located. Remember that big shapes always come first before you add any 'details'. I used a kneaded eraser to draw the curly hair instead of the tip of the pencil. Instead of delineating the strands of hair, I darken its surroundings and the wavy hair comes forward! I now look for other wavy hair and treat it the same way: using an eraser, darkening the tones around them and refining their shapes with the pencil if needed. Finally I am just looking for more variations among the dark, middle, and light tones until I can't find anything more. 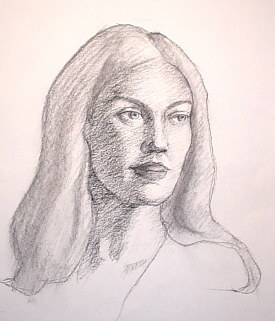 I use my finger to smooth out the shading and soften harsh lines between shapes in the hair. Remember that there are no sharp edges on human hair! I hope that this tutorial helps you learn to draw hair realistically. Once again, practice makes perfect. 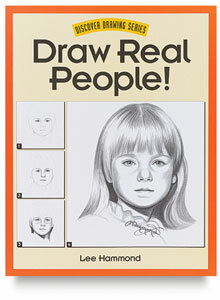 Before you know it, you will excel at drawing hair!